Sports tend to be the major reason most households don’t cut cable. People who watch sports on cable have done so for hundreds of games and know what to expect. Sadly, in addition to reliable and consistent service, you can also reliably expect a hefty cable bill each month from your cable company. With the rise of streaming services, sports aren’t locked behind a cable subscription anymore. You can continue to watch the same games on the same channels with the same quality for a fraction of the price you’re paying now. Services like DirecTV Now and PlayStation Vue cost only $40 a month to continue being a die-hard football fan. As soon as people think about watching an NFL game without cable, they start thinking of everything that can go wrong during crunch time. What if the streaming service fails during the game winning touch-down catch of the century? That one second of lost time can not only ruin a game, it can ruin your faith in streaming services forever. What if we told you that you today’s streaming services are not only much cheaper than cable, but are comparable in reliability and picture quality? We’ve personally streamed dozens of games across multiple platforms with little to no issue. There was a minor blip during the last Super Bowl, but it IS one of the most watch sporting events of the year and the services seemed to have learned their lesson. This article will show you the best streaming services to watch the NFL without cable and hopefully help you choose the right one. If you’re looking for College Football in addition to the NFL without cable, we’ve recently launched our 2018 guide to watching college football without cable. What do I need to watch the NFL without cable? What channels do I need to watch the NFL without cable? What Devices can I watch the NFL on? If you’re not familiar with live TV streaming services, they’re incredibly similar to Netflix or Hulu, but offer live cable TV channels instead of on-demand content. They offer the same exact channel that you get with traditional cable, but cost a fraction of the price and have smaller channel lineups. Each service will come with a variety of channels for a set price each month. Unlike cable, this monthly price isn’t part of a contract and can be cancelled at any time. Not only that, but most of them offer free trials to let you experience the service without a full commitment. To use these streaming services you only need a couple of things. Streaming services for live TV run through an internet connection. Although you can stop paying the cable companies for TV, you’ll still need to pay them to provide internet. You’ve probably heard that you’re saving money by paying for one of the cable company’s “Bundle Deals” and that standalone internet is going to be more expensive. While this may be true for the cost of a landline telephone, you most certainly aren’t saving money on internet while bundling. This is a myth and one that the cable companies aren’t going to try and correct. 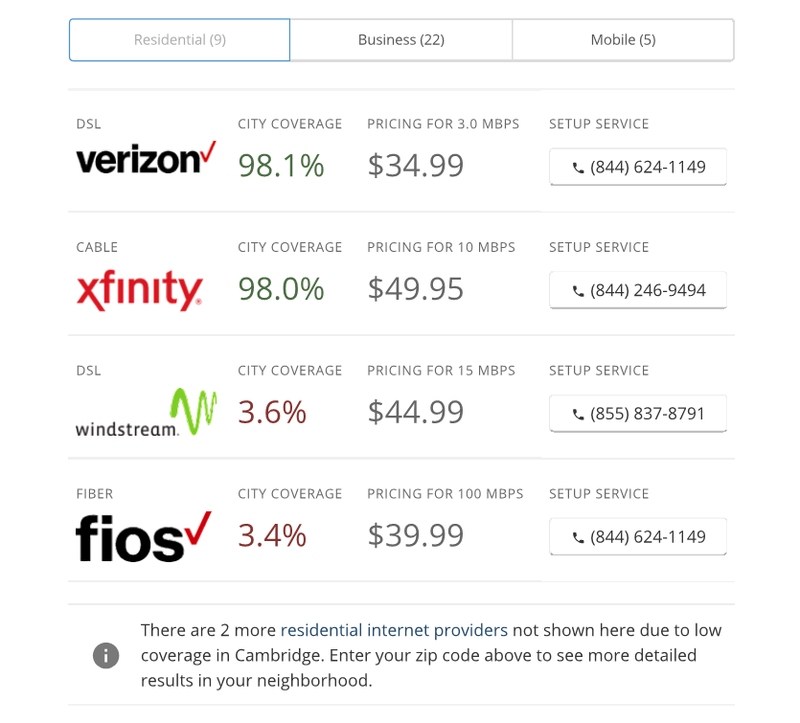 Most cable companies offer internet-only packages at a fraction of the price of their bundles. Since these companies typically want you to spend more money, it should come as no surprise that finding standalone internet isn’t the easiest thing in the world. Thankfully, the world is full of a lot of really smart people who make free tools on the internet. If you’d like to learn more about these tools, we’ve written a guide on how to get internet without cable that will show showcase some of them and help you save some money. A Roku Express is one of the best ways to watch the NFL without cable. The second thing you’ll need a streaming device. You can watch most streaming services on a computer or mobile device, but if you’d like to watch it on your TV you might need some help. Think of these devices as cable boxes for cord cutters, but much cheaper and without a rental fee! The Roku Express above costs $29.99 and streaming hardware doesn’t really go much above that. Even the premium devices still typically cost less than $100. Compare that to a $10 per month rental of a cable box over the course of a year long contract and you’ll start to see how quickly cord cutting saves money. Knowing what channels the NFL plays its games on is important to cut cable. Since each service has difference channel lineups, you can save a lot of money when cutting cable by knowing which channels you DON’T need. If you’re already familiar with the channels and NFL schedule, feel free to skip this section. If not, we’ll summarize each channel’s games so you can figure out what you need when deciding on your cord cutting package. ESPN airs Monday Night Football every Monday night at 8:30 PM EST. There is one game aired each week except for the first week of the season. The first week each season is a double header that is aired at 7:10 PM EST and 10:20 PM EST. CBS shows regional games covered every Sunday. Games on Sundays can be single header games played at either 1:00 PM EST or 4:05 PM EST. Sometimes there are double headers on Sundays taking place at both 1:00 PM EST and 4:25 PM EST. Typically, CBS will air the games that have an AFC team as the away team since they own the rights to the AFC package. Occasionally, CBS will also air Thursday night games throughout the season at 8:25 PM EST. This usually happens about five times a season. FOX also airs Sunday games. Like CBS, these can either be single header games played at either 1:00 PM EST or 4:05 PM EST or double headers on taking place at both 1:00 PM EST and 4:25 PM EST. Unlike CBS, FOX owns the rights to the NFC package and usually palys the games when an NFC team is the away team. Sunday Night Football is aired on NBC. If the name wasn’t clear, these games take place every Sunday night. The national broadcast airs weekly at 8:30 PM EST. Additionally, NBC will air some Thursday night games throughout the season. Usually there are between five and seven games played at either 8:25 PM EST or 8:30 PM EST based on where holidays fall. NBC might also broadcast one or two Saturday games at 8:30 PM EST or Monday at 4:30 PM EST based on holidays. (Christmas eve on a Sunday for example would move it to a Monday). The NFL Network (NFLN) plays almost every Thursday night NFL game at 8:25 PM EST. The only Thursday night games that it doesn’t air are the opening game of the season and a Thanksgiving night game (both of which NBC owns the rights to). Based on the holidays, it’s possible that NFLN may air some games in the Saturday (4:30 or 8:25 PM EST) or Monday (4:30 PM EST) slots toward the end of the December. For the 2017 season, there were 7 games scheduled exclusively to the NFLN, while the other 11 were also aired on NBC or CBS. When talking about the NFL Network, RedZone can pop up and makes things a little confusing. NFL Network RedZone (NFLN RZ) is a channel that highlights important plays during games and shows replays after they happen on CBS or FOX. It jumps between live games and plays on Sundays from 1:00 PM EST to 8:00 PM EST every week. There is also Red Zone Channel that is nearly identical, but is only for DirecTV subscribers and is operated completely independently. As a cable subscriber, you get access to hundreds of channel’s online live streams. Remember though, when you cut cable you can’t use these anymore. If you do have a cable subscription (sometimes the cheapest option, we don’t judge), you can use TV Everywhere Apps to watch the games. For example, ESPN has WATCHESPN, NBC has the NBC Sports App, and FOX has FOX Sports Go app. CBS on the other hand, has it’s own streaming service like Netflix or Hulu that will give you access to all of its games for $5.99 a month. A lot of people are familiar with DirecTV as an alternative to cable through satellite programming. However, they also offer a streaming service as a competitor to Sling TV, PlayStation Vue and others that don’t require a contract. The non-satellite streaming service they offer is called DirecTV Now. DirecTV Now is a fantastic service and has come a long way since its initial launch. Although less customizable than some of the its competitors, DirecTV Now is one the two cheapest options to watch the NFL without cable. It’s one of the few services that offer all four of the major channels that stream games while also having way more channels than any other service in its price range. Since DirecTV Now offers live local stations like ABC and NBC, make sure to confirm the channel lineup on their website to make sure the stations are available at your location. Gotta Have It – $75 /mo. 120+ channels. Each package adds channels onto the previous ones, but they never lose channels as you increase package size. If ESPN is included in the “Live a Little” package you don’t have to worry about losing it if you decide to upgrade. DirecTV Now also has smaller add-on packages like HBO or Cinemax for $5 a month or Showtime for $8 a month. If you’re interested in channel line ups for each of the packages, you can check out our DirecTV Now full review. It outlines the channels for each package as well as some pros and cons of the service. One of the benefits of DirecTV Now is that it gives you access to “TV Everywhere Apps”. This access lets you log into apps such as FOX Sports Go, NBC Sports, CBS Sports and dozens of others with your DirecTV Now login information. You can also watch regional sports networks (RSNs) if you get DirecTV Now’s “Go Big” or higher package. To find out what RSNs are available at your location you can input your zip code into their search page. This page also lets you check local availability to confirm you can get the local networks required to watch NFL games live. One of our biggest complains with DirecTV Now was its lack of DVR. Recently, DirecTV Now began offering “True Cloud DVR” to all subscribers. Their newly launched DVR is technically in Beta, but we haven’t had any issues with it in our limited testing. The DRV allows for up to 20 hours of recorded content and gives users the power to record entire shows or series. Thankfully, after recording something, you have the ability to skip through commercials and aren’t forced to watch them anyway like some of its competitors. Although 20 hours of content is a lot for one person, it does fall a little behind some of the other streaming services we’ve tried. With a couple people in the house or for someone who likes to rewatch content, 20 hours gets filled up really quickly. Compared to YouTube TV’s unlimited DVR storage, DirecTV Now’s looks minuscule. However, it’s hard to complain when they didn’t have a DVR at all 6 months ago! Most people who have used the internet recently know about YouTube. It’s the most popular video content database in the world and owned by one of the world’s largest companies. 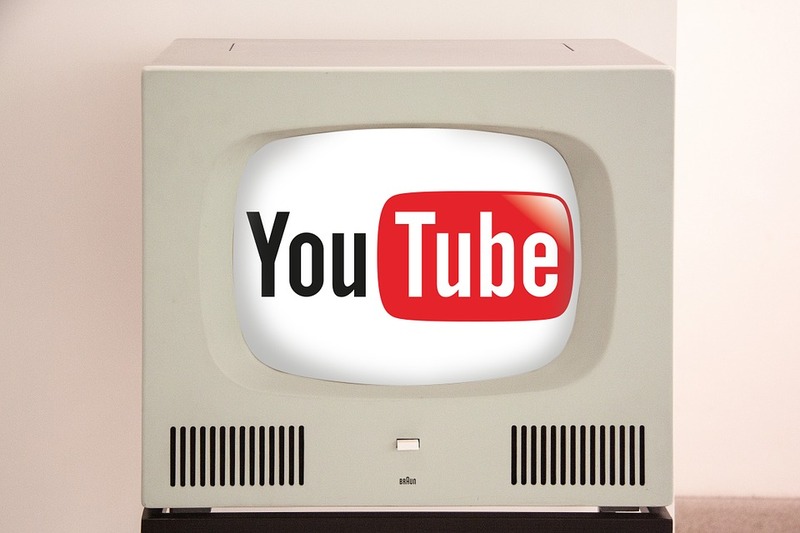 Google has been adding feature after feature to the video streaming site and has recently dove head first into live television streaming with YouTube TV. 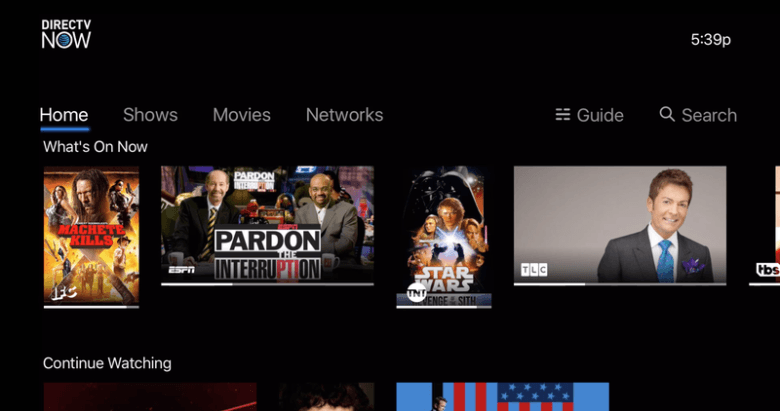 YouTube TV was released in April 2017 and has continued to improve the service since. It currently only offers one size package for a flat rate of $40 a month, but includes many popular channels. For NFL fans, YouTube TV offers all 4 major channels to watch games. Although it’s priced the same as DirecTV Now’s “Live a Little” package, we’ve opted to put it behind it on this list. The main reason for this is that the total amount of channels is much lower making the cost per channel higher. As we mentioned in our DirecTV Now section of this article YouTube TV boasts one of the best DVR services in the cord cutting industry. Their cloud based DVR is included in the $40 cost and offers unlimited recording. YouTube TV will store any recordings you make for nine months before it starts to mark them for deletion. Considering most services charge an additional fee for DVR and have a cap on recording time, it’s pretty easy to see why YouTube’s DVR reigns supreme. Another reason we’ve been enjoying YouTube TV over some of its competitors is its quality and reliability. Being such a major player in video services and having financial backing by Google, you can be certain that YouTube TV will work when you need it unless there’s a small scale alien invasion or something equally as horrifying. 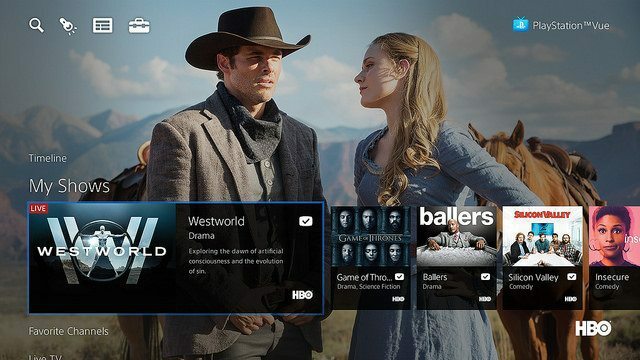 PlayStation Vue is Sony’s streaming service that confuses a lot of readers. Although it’s called PlayStation Vue, it doesn’t actually require a game console to use. Sony developed the software and initially launched it only through the PlayStation, but it’s now available on many other devices. Not only is PSVue a bit more expensive, it also comes with less total channels than DirecTV Now and YouTube TV for watching the NFL. That doesn’t mean YouTube TV shouldn’t be considered to watch the NFL without cable and is worth a look. It’s channel lineup is smaller, but you’ll get some channels with PlayStation Vue that you won’t with the other two that might make it a better fit for your household. PlayStation Vue has 4 core packages that range from $44.99 per month to $79.99 per month and multiple different add on packages. 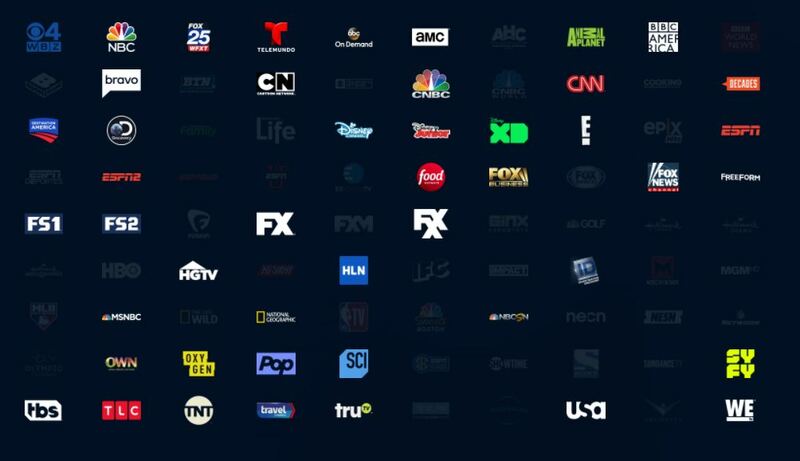 The image below shows the current PlayStation Vue channel lineup for their smallest packages, Access, at our Boston location. One of their add on packages is the Sports Package which adds 12 sports focused channels including the NFL Network RedZone, NESN, and NBS Sports for $10. Sony also changed the service’s DVR to be much better for sports fans. The recent change made it so that whenever you record any game, the DVR continues to record for 50 minutes after the game ends. Speaking from experience, there’s few things in the world more frustrating than missing overtime on a game you had to record because your DVR stopped at exactly X:00. 50 extra minutes won’t help much if you’re trying to record an 8-hour World Series game, but any bit helps. Sling TV is a streaming service owned by Dish. It’s core packages are labeled by color, Orange and Blue, and cost $25 a month each. 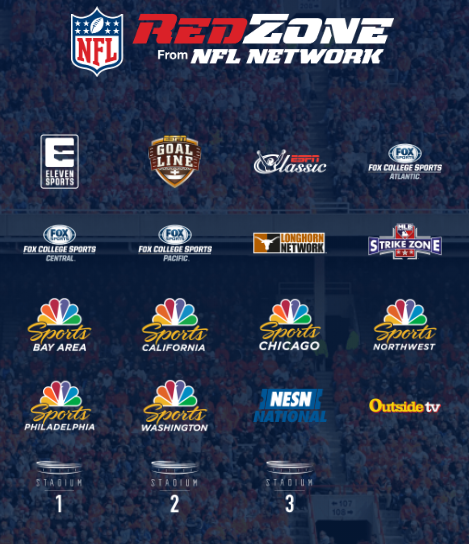 In terms of NFL channels, the Orange package includes ESPN, while the Blue package has FOX and NBC. You can get both together and save $5 a month bringing the total to $40 a month. You can also add on NFL Network RedZone in the Sports Extra pack for $10 more a month if you’re interested in the content it provides. 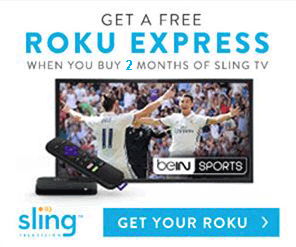 For now, Sling TV is as close to al la carte television as you’ll get. By keeping their package base prices low and offering small add on packages that target specific audiences, you really can build your own channel line up. Some of these packages include news channels, HBO, or Showtime and vary between $5 and $10 a month. It’s not perfect and you’ll undoubtedly pay for some channels you don’t need, but it’ll still be less than a cable contract. An entire package list and channel line up can be found in our Sling TV guide if you want to learn more. Another benefit of watching the NFL on Sling TV is that you’ll gain access to most TV Everywhere apps. 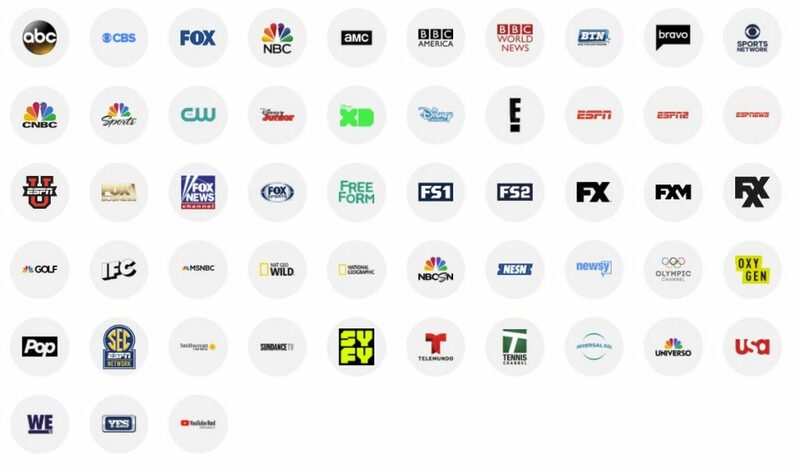 The TV Everywhere apps you’ll have access to if you subscribe to Sling packages that offer them, are in the following table. Keep in mind that Sling TV doesn’t offer CBS. You can get CBS All Access as a standalone service to watch any CBS games for an extra $5.99 a month. Due to its price being higher than other services even without the ability to stream CBS, we don’t recommend Sling TV as one of the best services to stream the NFL without cable. Due to its customization and low price point for a lot of cord cutters in general, we like to mention it in our guides when we can. After you’ve decided on a streaming service, you’re going to need a piece of hardware to use it. Unless of course you want to have you and your buddies crowed around your cell phone to watch the game. Typically when we suggest hardware for streaming services, the first one we mention is Roku. It supports all four streaming services that we mentioned in this guide as well as many others. It’s been a major player in streaming hardware for a while and has continued to develop it’s devices almost to the point of perfection. Please note: You can’t watch the NFL on Roku without subscribing to one of the services we mentioned above first. All Roku devices connect directly to your TV via HDMI, play video at 1080p, and some versions even support 4k streaming. The prices range from $29.99 for the basic model to $89.99 for their 4k Roku Ultra device. They’re incredibly easy to set up and the interface is almost as simple. 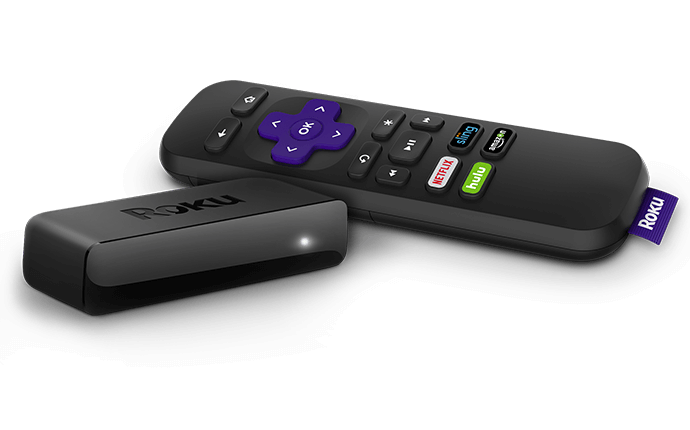 You can read our full Roku guide to find out more about the specific models, the channels it offers, as well as some things we like most about Roku. The Google Chromecast is a little bit different than a Roku. A Roku connects directly to whatever TV you want to stream on and can run an app for each service. All you need for a Roku is a subscription to a service and an internet connection and you’re good to go. A Chromecast, on the other hand, requires an additional device to actually find the stream. Rather than using apps native to the device, the Chromecast allows you to mirror a screen directly to your TV. For example, if you wanted to watch the game with your DirecTV Now subscription, you could navigate to the TV Everywhere App for the channel (FOX, NBC, etc.) on your computer or phone. You could then click a button on your screen and “cast” it directly to your TV. Although it does require a third device, you can do a lot more with a Chromecast than a Roku. A Chromecast basically turns your TV into another monitor for your computer or phone, so you’re only limited to streaming what those devices can do. The Fire TV is Amazon’s answer to streaming hardware. With a price tag of $39.99, it’s quite affordable for the quality of the device. With most people already being part of the “Amazon ecosystem” a Fire TV might make the most sense. For obvious reasons it has seamless integration with Amazon’s streaming service and can integrate with popular devices like Alexa. It connects directly to your TV’s HDMI port and comes with a remote to control it. It’s more similar to a Roku than a Chromecast in that it runs its own native apps to play streaming services. Like the Roku, every streaming service mentioned in this guide is available on the Fire TV. Amazon is continuing to improve the UI, but it still feels slightly behind some of its competitors. While it works better than most on mobile devices and tablets, the TV experience could be improved. It’s not so bad that the service isn’t still a great option, it’s just worth noting as a direct comparison to the other devices.